305 mm/40 41st Year Type2 х 2 pcs. Initial HE Shell Velocity732 m./s. Initial AP Shell Velocity732 m./s. 80 mm/40 41st Year Type8 х 1 pcs. Initial HE Shell Velocity680 m./s. 80 mm/40 41st Year Type4 х 1 pcs. 80 mm/40 41st Year Type6 х 1 pcs. 152 mm/40 41st Year Type10 х 1 pcs. Initial HE Shell Velocity701 m./s. 152 mm/40 41st Year Type4 х 1 pcs. Mikasa — Japanese promo premium Tier II battleship. The best squadron battleship of the Imperial Japanese Navy during the Russo-Japanese War. The ship was well-balanced, with very good armament, armor, and speed for her time. However, Mikasa was in many respects largely inferior to successive dreadnought battleships. Mikasa is now preserved as a military museum ship in Yokosuka, Japan. 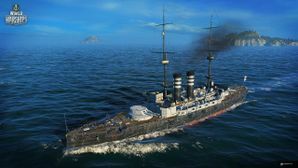 Mikasa was originally available for sale on select servers in mid-2015, in commemoration of the 110th anniversary of the Battle of Tsushima. She was later made available as a reward during July 2016 and April 2017 via in-game events. The only pre-dreadnought battleship in existence, both in-game and in real life, Mikasa has a unique place in the tier tree as the only Tier II battleship in the game. An interesting point to note is that the in-game secondary guns are only part of the full armament that Mikasa actually carried (most likely for game balance); not only did she carry additional small-caliber guns (two can be seen on either side of the upper deck and eight below the crow's nests), but she was also armed with 18-inch torpedoes, fired from two submerged torpedo tubes on each broadside (these torpedoes are not available in-game). With her low speed and short main battery range, she can struggle to bring her main guns to bear on anyone in the opening stages of the match. Even worse, she will be hard-pressed to focus both turrets on a single target due to their proximity to the superstructure - effectively meaning that most of the time, she will only be able to utilize 50% of her main battery firepower. Watch where the team is going, and once they have committed to a destination, don't deviate from it unless the situation changes or an emergency arises in another sector - then again, her low top speed would probably prevent you from having any real influence. Upon reaching the desired location, Mikasa makes for a great defensive screen; she has almost as much health as a fully-upgraded tier III South Carolina; bristling with 32 secondary guns, she can decimate anyone that dares come close. A viable (but risky and highly impractical) tactic is to simply charge at the enemy and let the secondary batteries pound them into the ocean while her main guns are reloading, but stay alert for torpedoes. Mikasa will be unable to catch up to anyone who has the presence of mind to keep their distance. That being said, her reasonable maneuverability and small size make her fairly decent at dodging torpedoes and incoming long-range fire. Incredibly good armour and health pool for Tier II. Powerful and numerous secondary batteries shred anyone that dares to venture within their 3km range (can be increased to 3.8km with flags and captain's perks). Very good turning radius with decent (for a battleship anyway) rudder shift time. Provides a unique departure from the usual game experience, especially for experienced Battleship players. Decent players (or those unfortunate enough to have experienced the secondary batteries) will keep a respectful distance. This is highly unlikely at this tier. But it can happen. Low top speed, made worse by her speed dropping like a rock if she makes even the slightest of turns, which probably contributes to her small turning radius. Only has access to Upgrade Slot 1. As a premium, Mikasa doesn't have any upgrades to research. Slot 1 provides players with the first option in choosing a desired role. Typically, Main Armaments Modification 1 is recommended to provide additional survivability to the main battery, but players who desire to specialize in the secondary armament should choose Auxiliary Armaments Modification 1 ( ). The following information is provided for players who wish to create a permanent captain for the ship. Those players who are retraining captains or using the ship to gain extra experience for a captain should consult the page relevant to the ship to which the captain will be assigned. As a premium ship, Mikasa comes included with Type 9 camouflage that lowers her detection radius, reduces the accuracy of incoming shells, and increases the amount of experience she earns. Mikasa also has an alternate premium camouflage called "Zikasa", in which she appears as she does during the Halloween scenarios "Saving Transylvania" and "Sunray in the Darkness". Mikasa (三笠) is a pre-dreadnought battleship built for the Imperial Japanese Navy (IJN) in the late 1890s, and was the only ship of her class. Named after Mount Mikasa in Nara, Japan, the ship served as the flagship of Admiral Tōgō Heihachirō throughout the Russo-Japanese War of 1904–1905, including the Battle of Port Arthur on the second day of the war and the Battles of the Yellow Sea and Tsushima. Days after the end of the Russo-Japanese War, Mikasa‍’​s magazine accidentally exploded and sank the ship. She was salvaged and her repairs took over two years to complete. Afterwards, the ship served as coastal defense during World War I and supported Japanese forces during the Siberian Intervention in the Russian Civil War. After 1922, Mikasa was decommissioned in accordance with the Washington Naval Treaty and preserved as a museum ship at Yokosuka. She was badly neglected during the post-World War II Occupation of Japan and required extensive refurbishing in the late 1950s. She is now fully restored as a museum ship and can be visited at Mikasa Park in Yokosuka. Mikasa is the last remaining example of a pre-dreadnought battleship anywhere in the world. Plans showing Mikasa as originally built, from Jane's Fighting Ships 1906-07. Turret layout for original 12-inch (305 mm) 40-caliber guns. Admiral Tōgō on the bridge of Mikasa, before the Battle of Tsushima in 1905. Mikasa as she appeared in 1905. The new 45-caliber 12-inch guns added during the reconstruction. This page was last modified on 18 October 2018, at 10:36. This page has been accessed 60,354 times.